Compiling this feature was a tad tricky as we’ve seen far fewer stinkers in 2016 than years prior. There were plenty of average games – Alekhine’s Gun, Carmageddon: Max Damage, Mighty No. 9 and TMNT: Mutants in Manhattan spring to mind – but nothing truly terrible. We’re talking Ride to Hell: Retribution levels of awfulness here. While the five games below reviewed poorly, mostly gaining scores around the 4/10 mark, you could probably still squeeze an hour or two of play out them before tedium set in. That’s the biggest offender here – tedium. These games are either basic, boring or both, hence why we’ve opted for the title ‘Five forgettable games’ for this piece. We’ve come a long way since ‘Metacritic’s Worst Games of 20XX’. Or at least we’d like to think. We really wanted to write about scrolling brawler Rock Zombie on Xbox One – a game so broken that it refuses to let us save progress – but upon closer inspection we discovered it was released in December 2015. Talk about a narrow escape. Mild disclaimer: we haven’t experienced this top-down shooter for ourselves. Footage on YouTube tells us just about everything we need to know, however. It’s a game so low budget that Activision was seemingly happy to pass development duties over to Fireforge, a studio $12m in debt. Just three days after Ghostbusters’ release, Fireforge filed for bankruptcy. We guess this explains why the developer’s name wasn’t attributed to the project when it was announced, exactly three months to the day of release. All the hallmarks of a rush job. 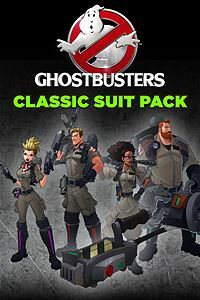 As well as suffering from repetition, linear level design and a chronically slow pace, it had one other insult to throw into fan’s faces – the £3.19 ‘Classic Suit Pack’ simply removed the stripes from the character’s standard costumes. Activision also couldn’t resist launching it on the digital services a few days ahead of the retail release, knowing that some fans would pay full whack to get it early. Had the publisher considered a lower price tag, to reflect the game’s budget, then maybe gamers would be a tad more accepting. The £39.99 asking price was, frankly, a joke. We dare say a remake of Activision’s own 1987 Ghostbusters game would have gone down better. We firmly believe indie developer Nnooo had the best intentions when creating this turret shooter, hoping that it would appeal to fans of Kinect Fruit Ninja, Angry Birds and other casual games that were moderately successful on console. Sadly, the end result was something of a misstep. The concept is as simple as they come: blast enemy bunnies before they reach your turret, while collecting coins to upgrade your feeble ‘pea-shooter’ style starter cannon. Pumpkin bombs, runner bean lasers and others are eventually added to the arsenal, some more effective than others. To begin with, the average game lasts around 2-3 minutes. After a few weapon upgrades, the average survival time slowly starts to rise. This is pretty much the whole game in a nutshell – the more you play it, the longer you’re able to survive. That’s to say, your reward for sticking with it is that you get to play for longer. This would be fine if it wasn’t for the fact that it’s a tedious turret shooter; the kind of thing that’s found in just about every first-person shooter ever in a vain attempt to induce variety. By copying the structure of a typical mobile game, it feels like one. There’s no shaking it – it even launched with dozens of IAPs for costumes and such. Just to illustrate how misguided Blast ‘em Bunnies is, it isn’t even suitable for children – the one demographic that may be able to tolerate its simplistic nature. 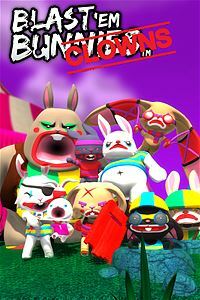 It has a 12+ age rating, presumably due to the inclusion of the rather sinister ‘Throat Slitter’ bunny. We’ve long suspected that the Xbox One’s ‘Games with Gold’ freebies are planned months in advance. This belief was fuelled by the fact that The Deer God, Pool Nation, and other games that made their Xbox debut as a freebie suffered from glitches and a general lack of polish. With their release dates set in stone, the developers were clearly up against a tight deadline to get them ready. ZHEROS – which was free back in January – pretty much confirmed this suspicion. It launched in a horrific state, suggesting that developer Rimlight had to skip playtesting to get it out the door. Checkpoints placed far apart, frequent difficulty spikes, frustrating platform jumping stages, broken achievements…the list went on and on. 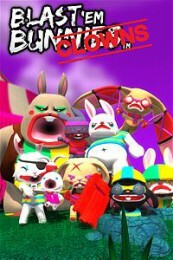 A patch did rectify some problems, but by the time it was released most gamers had either deleted ZHEROS from their hard drive, or given up entirely – using TrueAchievements as a reference, very few gamers have played it through to the end. It had other, more fundamental, problems too. Despite being billed as a ‘sci-fi scrolling brawler influenced by Saturday morning cartoons’ there were very few attempts at humour. Characters were mute throughout and after villain Dr. Vendetta was introduced in the opening intro they didn’t show their face again until the final confrontation. Character development really isn’t a highlight – although two playable characters are present, they can’t be swapped between during stages, forcing you to stick with the one you picked throughout the game’s entire 8-10 duration. 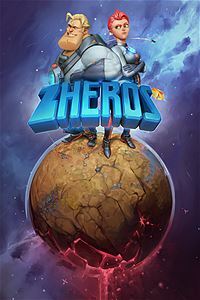 The weekend we spent playing ZHEROS felt completely wasted, and with the achievements glitched to kingdom come, we didn’t even have anything to show for our patience and toil. We took a punt on 7 Days to Die, popping down to GAME on launch day to pick up a copy. 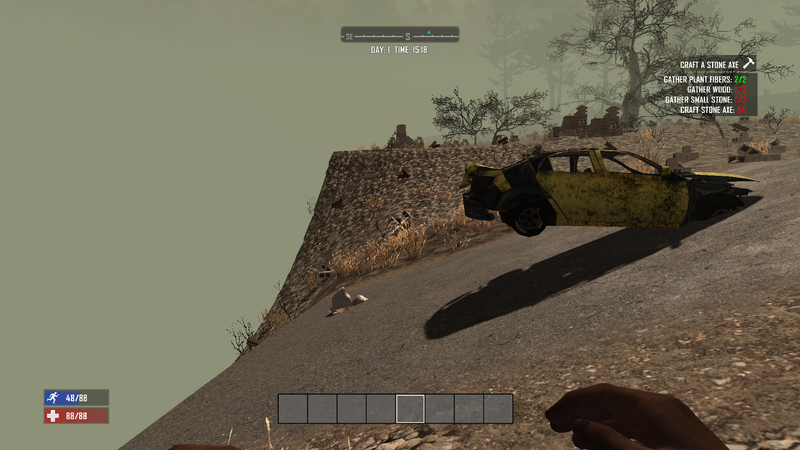 The PC original had decent reviews on Steam, the premise – a Minecraft style survival game, with zombie hordes and online co-op play – held appeal, and the output of publisher Telltale is usually good. A £30 price tag sealed the deal. What could go wrong? It ticked all the right boxes. Here’s what Telltale didn’t tell us – it has been in early access on PC since 2013. Visually, it’s dated to the extreme. 2013? Try 2003 – it resembles an original Xbox game for most part. The draw distance is abysmal with heavy use of fog, the frame rate is prone to stuttering, the zombies look crude and ugly and the environments are coated in fuzzy, heavily recycled, textures. The randomised nature does the game no favours, with the basic algorithms frequently placing objects in mid-air in a similar manner to No Man’s Sky. The lack of assets makes every square inch of the map look the same as the last, and so there’s no incentive to explore other than to find resources. Approach the edge of the game world and you’ll be presented with a vertical drop, with environmental objects – cars, trees, etc – floating in an endless abyss. It’s a complete mess, and although the actual crafting element is quite in-depth, the experience is more frustrating than fun as there are too many factors to keep an eye on. Not only must your character be kept well fed, but also hydrated and warm. Death comes swift and often; respawn in a hostile environment and you may as well quit and start again. Even if you look past the dated visuals and technical issues, you’re still left with an amateurish and blatantly unfinished experience. It has this horrible feel to it that’s impossible to shake; it’s the gaming equivalent of buying a movie you’ve never heard of on a whim, and then finding that it’s unwatchable garbage created on the lowest budget imaginable. It genuinely resembles one of those Minecraft clones found on the Xbox 360’s indie service. When we played it online over launch weekend most of the team chatter was heard was from fellow gamers who felt ripped off and simply astonished by its shoddiness. Like ZHEROS, this was another Xbox One ‘Games with Gold’ freebie that held much potential but sadly squandered it all. It’s an online co-op focused dungeon crawler, which removes some of the well-worn genre tropes by featuring bright colour schemes and four main characters resembling ‘90s action figure line. The Ninja Turtles, specifically. There’s supposed to be a heavy metal theme present as well, but once the opening intro ends this is soon forgotten about. We’re back to hacking up skeletons, knights and other generic dungeon folk with swords, magic wands, crossbows and similar weapons. Rock music doesn’t even feature – a dreary and monotonous melody plays in the background. Alternatively, there’s a dubstep soundtrack which – we kid you not – will set you back a few extra quid as it’s DLC. Both the single-player and multiplayer modes are flawed, each in their own unique ways. The single player mode is punishingly tough as there’s nobody to come to your aid when dying, and so the stockpile of extra lives soon depletes. Each of the three dungeons must be completed in one shot – there are no checkpoints whatsoever – so every time you pick up the controller and play, you’re back at the start. This has a huge impact on the overall sense of progression. The multiplayer dungeons are designed with co-op play in mind, featuring puzzles that require players to pull levers and open drawbridges for one another. Because of this, you can’t play online without a full squad of bros. If more than two players quit, then the game can no longer progress – you’re thrown back to the title screen. There’s no drop in/drop out play either, so every match begins with a very long wait in a lobby. Cross your fingers and hope nobody quits. 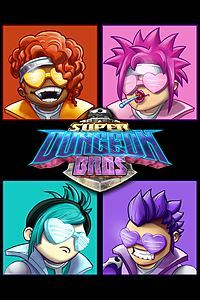 There’s nothing worse than seeing “You’ve been ditched by your bros” as you’re about to reach a dungeon’s final floor after roughly an hour of play. How about showing some brotherly love for your fellow online gamer, eh?